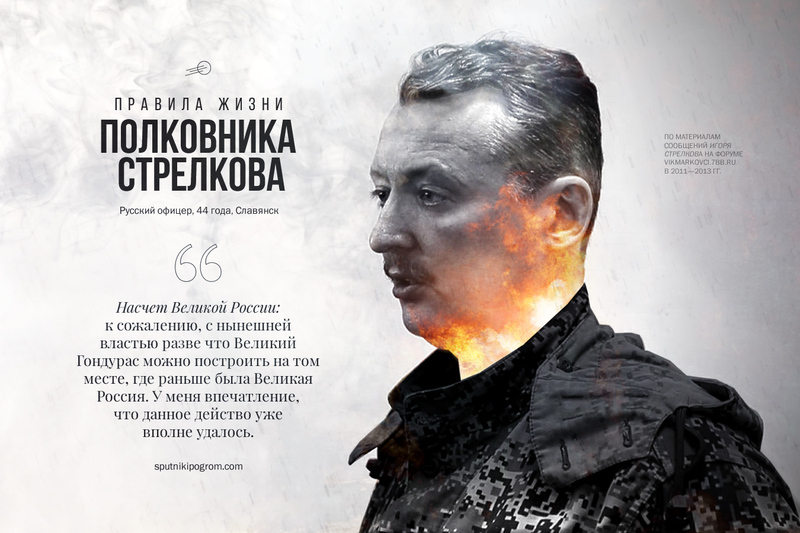 Picture below captioned as follows: The rules of the game by Colonel Strelkov, Russian Officer, 44 years old, Slavyansk. Russian, Ukrainians (Ruthenians) and Belorussians represent three branches of the Russian Ethnos. The task of these Ukrainian Nationalists and their Russian counterparts seems to be to maintain ill will towards each other. What needs to be understood? The fundamental task – to prevent the re-emergence of a unified, coherent state based on these shared Slavic roots. War is, above all, fear, a fatal numbing tiredness, inescapable filth. Moreover, war, for those directly participating in it, is a colossal explosion of emotion and sensation, after which civilian life seems simply without meaning. In war both the finest and most degraded aspects of the human condition assume their most vivid form. This can manifest itselves in alcoholism and debasement. However one can also realise oneself in a positive way. The disciplined forces of a great Empire are simply morally and spiritually beyond comparison to those of a mob. I was present during the collapse of the [Soviet] Union as an aware adult (20 years old). Even at that point I was a conscious monarchist but, being subject to the anti-Soviet hysteria, I was overwhelmed by contradictory emotions. On one hand I felt satisfaction at the sight of the destruction of what was fundamentally an anti-Christian, anti-Russian and inhuman state. On the other hand there was the acknowledgement that the State was being literally destroyed and from those fragments it was fanciful to hope for the rebirth of the old Russia. There was also a strong premonition that those who spearheaded the revolution, represented none other than the most vile elements of the Soviet Nomenklatura and acted purely in support of their own material interests. Unfortunately that premonition came fully to fruition. If during our age a serious war breaks out (I wouldn’t discount the possibility), do you really think that anyone could go through it with “unsullied hands”? From personal experience I can testify that saints in the modern-day Special Forces simply don’t last very long. After having understood that I am a soldier, all the “young students” (as it turned out) started to accuse me of “serving the evil regime of Medvedev & Putin” and of being an “enemy of Russia”. I was frequently referred to as a “scoundrel” or as “ignorant” and other “pleasant” epithets (including some that are not fit to print). Even the status quo itself teeters on the brink of catastrophe. The collapse could happen in a matter of years and, should it not be averted by some kind of miracle, it will inevitably occur, burying for ever even the remains of our Russian civilisation from which by day we draw nourishment, all the while struggling to ignore what is going on around us. In order to escape this trap it is imperative that a rebirth of Russia is required in order to have any hope at all of preserving any of our past traditions. If the people are armed and organised then the plans of our rulers to count on the followers of Kadyrov will turn to dust. These people are heroes only in their own legends (they are essentially all traitors and deserters from previous wars) and are hardly likely to place themselves on the line. They are perfectly capable of shooting someone in the back from an ambush but they would not put themselves in danger. In the event of a real ‘dust-up’ they are likely to simply spit on it all and go off and rob a few jewellery stores. Gentlemen! All elections are really held in the FAPSI (Federal Agency of Government Communications and Information). It doesn’t matter who and how many people voted. In the GAS (Automatic State System) election system the result is predetermined by which ‘favourites’ simply cannot receive a percentage of the votes less than input. The chosen candidate simply cannot poll less than 60% even if only a couple of people in the whole country voted for him. May God be merciful to Russia and grant her a sovereign ruler. There is simply no-one who fits the bill amongst our contemporary politicians. The Fatherland is an abstraction. To each and everyone the word means something different. For some it represents a value for which one is willing to sacrifice. For others it’s just an empty sound and a comfortable alibi for their own disreputable dealings. However the State has a completely concrete meaning. There is no gain in mixing up the two, State and Society – they are fundamentally different things. Kadyrov was dubbed a ‘Hero of Russia’ by the State (in fact his own nominated government) for some services or other to the State (again his government). For him Russia is absolutely not his Society. The definition of the White Idea is extremely amorphous. I’m inclined to consider that it best finds it expression in the works of Solonevich and Illyin. There are many who could differ with me on that view. I am 100% convinced that Bolshevik power still holds the reins in Russia. I also agree that the Bolshevik idea has mutated so much as to become unrecognisable. It is clear that the formal ideology of the Bolsheviks has become its antithesis. However in its deepest essence it retains critical aspects; its anti-Russian, unpatriotic, heretical trajectories remain fully intact. Its adherents are the linear ideological heirs of those who perpetrated the October revolution in 1917. They have changed their brand but the essence is exactly the same. Now having shed the ideology which hindered their personal enrichment and their diversion into material pleasure, they have remained in power. In 1991 there was a coup. The counter-revolution, to this day, has not been carried out. Given the Western imperatives [to destabilise Russia], the attacks on Putin will not cease. They will continue with renewed vigour. Does this mean that we should support Putin? Of course not! More to the point, rather, it would be possible to support him, on condition that he make a change of course, a break with the criminal and that thoroughly bandit circle around him. However the likelihood of him taking that course is vanishingly small. His policies swing like a pendulum. He tried to satisfy at the same time the West and bases his constituency on Patriotism. This is the typical politics of a Latin American ‘Banana Republic’ Dictatorship which has fought its way to power and, will at any costs, maintain it. In line with demographic projections, within 15 years in every single Moscow school, Tadjiks, Kirghizis and Kazakhs will comprise no less than half and up to two thirds of the children enrolled. Azeris and other Caucasians will comprise another quarter. The Russian enrollment will comprise only between 10-15%. We already see in our infant classes (I know from personal experience in one case and I have been informed by teachers regarding other instances) where the number of Kazaks and Asians is greater than the number of Russians enrolled. Do you seriously imagine that they will care about exhibitions and museums commemorating some distant civil war (where Russians killed other Russians)? It is deeply unfortunate that honest Russians, patriots, caring about the fate of our land, interpret our epic and tortured journey through history as an inspiration for the resumption of enmity and bigotry. It is precisely this enmity and bigotry that devastated our land. Rogozin is simply a project in public relations. You want Nationalism? You’ve got it! Look at me! It’s a tactical card played by Surkov, nothing else. This is simply a façade to prevent the emergence of a genuine leader. The presidential administration has a production line that regularly outputs such figurines. The people are one, one whole – indivisible. You can’t really categorise and separate them into simple and educated. When the people really do “break themselves up” then you get confusion and civil war. It’s only when these artificial barriers are broken down that these wars can end. Текст ниже составлен по материалам сообщений руководителя Народного ополчения Донбасса Игоря Стрелкова, оставленных им в 2011—2013 гг. на форуме vikmarkovci.7bb.ru. В квадратных скобках — примечания «Спутника и Погрома». РУССКИЕ, УКРАИНЦЫ (МАЛОРОССЫ) И БЕЛОРУСЫ — СУТЬ ТРИ ВЕТВИ ОДНОГО РУССКОГО НАРОДА. Задача их стравить между собой решается постоянно — как со стороны «украинских», так и со стороны «русских» «националистов». Что тут непонятного? Главная задача — не дать снова объединиться в единственно жизнеспособное государство со славянским национальным ядром. В ГОРАХ БЫВАЛ. В частности, в 1992-93, 1995, 1999-2005 много ходил в разведывательно-поисковые действия. В том числе — в «Черные горы» Веденского и Урус-Мартановского районов. ВОЙНА — ЭТО ПРЕЖДЕ ВСЕГО СТРАХ, смертельная свинцовая усталость, безвылазная грязь. Вместе с тем, война — для тех, кто в ней непосредственно участвует — это колоссальный взрыв эмоций и ощущений, после которых мирная жизнь долго кажется ненастоящей. На войне все самое лучшее и самое дурное в человеке приобретает острейшие формы. ОНИ СЕБЯ ПРОДЕМОНСТРИРУЮТ, РАЗГИЛЬДЯЕВ И АЛКАШЕЙ. А мы можем показать себя — дисциплинированные войска Великой Империи, которые морально и духовно на много порядков сильнее, чем толпа швали. Я ПРИСУТСТВОВАЛ ПРИ РАСПАДЕ СОЮЗА во вполне дееспособном (20 лет) возрасте. Уже тогда я был сознательным монархистом, но, при всем антисоветском настрое, меня одолевали противоречивые чувства. С одной стороны, было удовлетворение от того, что на глазах рушится антихристианское, антирусское, античеловечное в своей основе государство. С другой — понимание того, что оно именно РУШИТСЯ… и под его обломками вряд ли сможет произойти возрождение исторической России. Еще было острое предчувствие, что люди, которые встали во главе «революции», есть плоть от плоти самой гнусной разновидности советской партийной номенклатуры и действуют в сугубо личных корыстных интересах. К сожалению, это предчувствие полностью оправдалось. ЕСЛИ И НА НАШ ВЕК ВЫПАДЕТ БОЛЬШАЯ СЕРЬЕЗНАЯ ВОЙНА (что не исключено), то вы всерьез полагаете, что кто-то «пронесет ручки чистенькими» через нее? По своему опыту могу сказать: чистоплюев в современном спецназе не держат. ЧЕРЕЗ НЕКОТОРОЕ ВРЕМЯ, ПОНЯВ, ЧТО Я ВОЕННЫЙ, вся эта «студенческая молодежь» (как выяснилось) начала меня обвинять, что я «служу антинародному режиму Медведева-Путина» и что я «враг России». Был многократно назван «хамом», «быдлом» и многими другими «приятными» эпитетами (включая нецензурные). Я ГОВОРЮ О ТЕХ, КТО СПОСОБЕН НЕ ТОЛЬКО ПЯЛИТЬСЯ В ПРОКЛЯТЫЙ ЯЩИК, НО ДУМАТЬ И ДЕЙСТВОВАТЬ — а это в любом обществе 5-7% населения (у нас, вероятно, еще меньше — «селекция» советских лет сказывается удручающе). За них и придется вести борьбу (она, собственно, и так уже идет). ДАЖЕ ТО, ЧТО ЕСТЬ СЕЙЧАС — КОЛЕБЛЕТСЯ НА ГРАНИ КОЛЛАПСА. И коллапс этот может произойти в ближайшие годы. И, если его не удастся каким-то чудом предотвратить — обязательно произойдет, похоронив под собой остатки всего привычного Русского Мира, коими мы по сей день окормляемся, стараясь не замечать того, что происходит вокруг. Чтобы спасти ситуацию, в России нужно ПРИНЦИПИАЛЬНО НОВОЕ Белое Дело. И оно, надеюсь, еще появится. И вберет в себя, даст Бог, какие-то традиции минувшего. ВЫ НАСТОЛЬКО НАИВНЫ, ЧТО ВСЕРЬЕЗ ПОЛАГАЕТЕ, ЧТО ОНА, ЭТА ПЕНСИЯ, БУДЕТ ИМЕТЬ МЕСТО? Я не уверен, что 9 оставшихся мне на службу лет продержится само государство… А про пенсию я не думаю вообще. ЕСЛИ У НАСЕЛЕНИЯ ОКАЖЕТСЯ ОРУЖИЕ И ОРГАНИЗАЦИЯ, ТО РАСЧЕТЫ ВЛАСТЕЙ НА «КАДЫРОСОВ» ПОЛЕТЯТ В ТАРТАРАРЫ: вайнахи только в собственных легендах героические, среди кадыровцев (которые, по сути, все поголовно предатели-перебежчики из бывших боевиков) людей, готовых головы класть, нету. Стрелять в спину и из засады они хорошо умеют, но оказаться в такой же ситуации самим им категорически не понравится. В случае реального сопротивления они тут же на все плюнут и пойдут ювелирные магазины грабить. Я БОЛЬШЕ ГОДА ЧИСТОГО ВРЕМЕНИ ПРОВЕЛ В ТЕХ МЕСТАХ, ГДЕ ПОГИБЛА 6-Я РОТА [Псковской дивизии ВДВ]. ГОСПОДА! ВСЕ «ВЫБОРЫ» ДЕЛАЮТСЯ В ЗДАНИИ ФАПСИ В БОЛЬШОМ КИСЕЛЬНОМ ПЕРЕУЛКЕ (МОСКВА). Сколько и кто проголосовал — без разницы. В систему «ГАС-выборы» в компьютер заранее закладывается результат, согласно которому «фавориты» просто не могут получить меньший процент, чем заложен. ЕР должна получить не менее 60 % — и она их получит, даже если во всей стране за нее проголосуют только Вован и Димон. ГОСУДАРЯ ДАСТ ГОСПОДЬ, ЕСЛИ БУДЕТ МИЛОСТИВ К РОССИИ. Среди ныне известных нам политиков Его нет. ОТЕЧЕСТВО — АБСТРАКТНОЕ ПОНЯТИЕ. Ощущение его наличия — сугубо индивидуально. Для одних — это ценность, за которую существует готовность жертвовать чем-либо, для других — пустой звук и удобное прикрытие собственных темных делишек. Государство же — вполне конкретное понятие. Оно реально существует. Не следует смешивать понятия Отечества и государства — это суть разные вещи. «Герой России» Кадыров награжден государством (его руководством) за некие заслуги перед оным государством (его руководством). Для него Россия — ни разу не Отечество. САМО ПОНЯТИЕ БЕЛОЙ ИДЕИ КРАЙНЕ АМОРФНО. Я склонен считать, что лучше всего оно выражено в трудах Солоневича и Ильина, но со мной многие могут быть не согласны. ЕСЛИ ЧТИТЬ ПАМЯТЬ БЕЛОГО ДВИЖЕНИЯ НЕЛЬЗЯ В ФОРМЕ НА РЕКОНСТРУКТОРСКИХ МЕРОПРИЯТИЯХ, ТО Я ВПОЛНЕ СМОГУ ДЕЛАТЬ ЭТО В ИНДИВИДУАЛЬНОМ ПОРЯДКЕ, либо там, где это возможно, не роняя своих Чести и Достоинства. Извините, но мне, действующем старшему офицеру, вообще невместно стоять в одном ряду с людьми, для которых Офицерская Честь — красивый «бренд», а Мундир — «дизайнерское достижение». Слава Богу, я достаточно много повоевал в реальных войнах, чтобы спокойно перенести неучастие в войнах игрушечных. НУ, И ГДЕ ОНА — ТУПАЯ АГРЕССИВНОСТЬ ЭТА — БЫЛА ПРИМЕНЕНА? В АФГАНИСТАНЕ И ЧЕЧНЕ. Как там действовали ВДВ? Как пехота. Типа «элитная». Только вот загвоздка — по-настоящему элитной пехотой и там, и там были бригады и отряды спецназа ГРУ. А десантники так, на подхвате. Причем, обычные мотострелки куда предпочтительнее — у них вооружение более пригодно и его намного больше. ХАМ — ЭТО ВСЕГО ЛИШЬ ОРУДИЕ… страшное и ржавое, но не более. Рука, управляющая этим орудием, скрыта за кулисами. Россия погибла из-за того, что Хама тщательно выпестовали и выпустили на волю, объяснив ему, что он — «соль земли» и «право имеет». Я БУДУ ЖДАТЬ СЦЕНАРИЯ… [ИСТОРИЧЕСКОЙ РЕКОНСТРУКЦИИ] Насколько я понял, будут именно бои на баррикадах. Мне, например, видится вполне «исторический вариант» — со стрельбой из револьверов из толпы по солдатам, убийством часового, битьем фонарей… И лишь потом — собственно баррикадные бои. При желании, в рамках мероприятия вполне можно показать всю мерзкую сущность толпы «революционеров» — их неряшливо-убогую идеологию, презрение к любому благородству и порядочности. ВЛАСТИ НА ВСЁ СЕЙЧАС, КРОМЕ ЛЕГИТИМАЦИИ ПРЕДСТОЯЩИХ «ВЫБОРОВ» и выработки правил ее распила на предстоящие 6 лет, глубоко наплевать. ПО МОЕМУ ГЛУБОКОМУ УБЕЖДЕНИЮ, БОЛЬШЕВИСТСКАЯ ВЛАСТЬ ПО СЕЙ ДЕНЬ ОСТАЕТСЯ В РОССИИ. Да, она мутировала почти до неузнаваемости. Да, формальная идеология этой власти сменила знак на прямо противоположный. Но она остается неизменной в основе: в своей антирусской, антипатриотической, антирелигиозной направленности. В ее рядах — прямые потомки тех самых людей, которые делали революцию 17-го. Они просто перекрасились, но сути не изменили. Отбросив идеологию, мешавшую им обогащаться и наслаждаться материальными благами, они остались у власти. В 1991 году был переворот. Контрреволюции до сих пор не состоялось. Я НЕОДНОКРАТНО РАСПИСЫВАЛСЯ В УВАЖЕНИИ к Русскому Корпусу в Югославии. В СВЯЗИ С ИНТЕРЕСАМИ ЗАПАДА [ПО ДЕСТАБИЛИЗАЦИИ РОССИИ] ВЫСТУПЛЕНИЯ ПРОТИВ ПУТИНА НЕ ПРЕКРАТЯТСЯ.Они будут продолжаться по нарастающей. Значит ли это, что нам надо поддерживать Путина? Конечно, нет! Вернее, его можно было бы поддержать — при кардинальной смене им курса, отказе от компрадорского и насквозь проворовавшегося окружения. Но вероятность, что он пойдет на это, ничтожно мала. Вся его политика — это «качели», он пытается и Западу угодить, и на патриотов опереться. Типичная политика латиноамериканского диктаторчика, дорвавшегося до власти и никому не желающего ее уступать. НО «БОЛОТО» ВЗОРВАНО ИЗНУТРИ, стоячая вода перемешалась, наряду с гнильем и грязью наверх выходят и задавленные слои, которые одинаково несовместимы ни с Путиным, ни с его «либеральными оппонентами» (которые суть — всего лишь «разные фланги» одного антироссийского фронта). Мы еще имеем шанс увидеть и ярких новых лидеров, и силы, которые пойдут за ними. Голосовать на этих выборах можно за кого угодно — они ничего не решают. Впереди — новая схватка. Стране она обойдется очень недешево, но лучше сгореть, чем сгнить. ПРОСТИТЕ, НО ПОСЛЕДНЕЕ УТВЕРЖДЕНИЕ — редкая бредятина. Это я Вам как специалист по антипартизанской борьбе говорю. СОГЛАСНО ПРОГНОЗАМ ДЕМОГРАФОВ, всего через 10-15 лет во ВСЕХ московских школах таджики, узбеки, киргизы и казахи будут составлять от половины до 2/3 учащихся. Еще четверть составят азербайджанцы и прочие кавказцы. Русские учащиеся составят 10-15%. Уже сейчас в младших классах многих школ (не понаслышке знаю, друг — завуч в одной из таких) кавказцев и азиатов больше, чем русских. И вы всерьез полагаете, что им нужны будут какие-то таблички и музеи в школах о какой-то Гражданской войне (в которой русские сражались против русских)? ОБИДНО, ЧТО ЧЕСТНЫЕ РУССКИЕ ЛЮДИ, патриоты, болеющие за судьбы Отечества, рассматривают нашу тяжкую историю в качестве источника возобновления вражды и неприязни, которые уже погубили страну в прошлом. В ЦЕЛОМ ЖЕ, ДВИЖЕНИЕ РЕКОНСТРУКТОРОВ — НЕПОЛИТИЧЕСКОЕ ХОББИ. Оно таким было, есть и останется. Но это вовсе не значит, что Марковский полк — чисто реконструкторское объединение. Марковский полк — это ОБЩЕСТВО ЕДИНОМЫШЛЕННИКОВ, примерно одинаково воспринимающих историю своей страны и старающихся хоть как-то поддерживать традиции одного из славнейших белых полков. Сохранение и почитание памяти этого славного полка вполне укладываются в рамки пропаганды Русской идеи. РОГОЗИН — ВСЕГО ЛИШЬ «ПИАР-ПРОЕКТ». «Вам надо национализьма? — Их есть у меня!» Бубновая шестерка из рукава Суркова, не больше. Чтобы настоящего лидера-патриота не появилось, Администрация Президента регулярно штампует такие вот фальшивки. Я УЖЕ БОЛЬШЕ 15 ЛЕТ НЕ ЗАНИМАЮСЬ [ИСТОРИЧЕСКИМИ] исследованиями (если до отставки доживу, может быть, возобновлю занятия). Пишу художественную прозу (сказки) — она не требует столько времени на работу в архивах. Только вот никак не опубликуюсь. Интервью Игоря Стрелкова без купюр: Кто, откуда и зачем!